I used the Big Agnes Seedhouse SL1 that I bought from EMS. For the most part, this was a very good tent. It was extremely light, quick and easy to set up, and packed up small. With the raincover, it was totally waterproof. However, it got pretty hot inside the tent with the raincover on and I wished there was more ventilation in the tent. I also had a groundcover to protect the bottom of the tent. 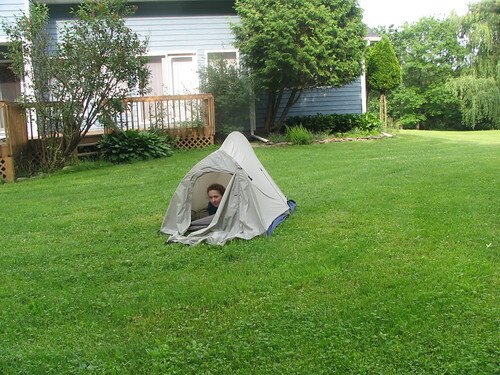 I usually remembered to tuck it under the tent when I set it up, but forgot once and it rained that night. In the morning I was sleeping on a big puddle of water. It was a miserable, clammy night. Without the raincover, there was virtually no privacy. Since I was camping in camgrounds with lots of people around, I didn’t want to sleep without the raincover on the tent, so around the end of July and into August it got really hot and uncomfortable in the tent at night. 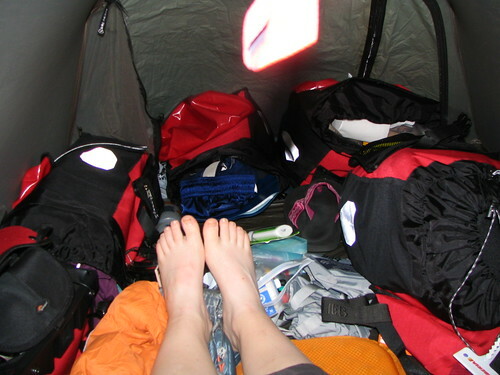 There was enough space in the tent for me and all of my panniers. In the beginning of my trip, I kept the panniers in the tent with me, but I met some Slovenian guys in Sardinia who were touring and they just left their panniers on their bike at night so I started doing that too and it was nice to have the extra room in the tent and not have to load and unload the bike every day. There is also a nice little vestibule that’s only part of the rain cover, where you can leave stuff that you don’t want to get wet but don’t want to take in the tent with you. 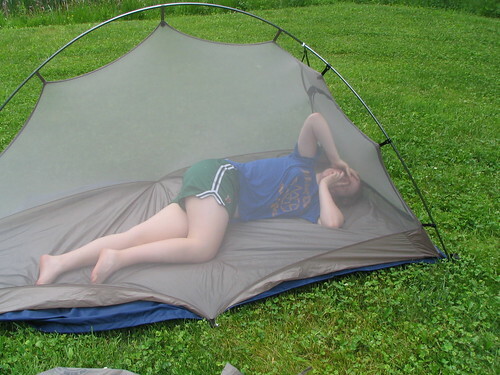 Overall, this was a really great tent, but I wish it was more ventilated.